Juniper Sling is an homage to London Dry Gin and the Jazz Age. Really, you couldn’t get a better beverage to inspire a fragrance than gin. It can be infused with a wide range of natural botanicals including citrus peel, almond, angelica, saffron, orris root and even frankincense. The botanicals are released into the air straight out of the bottle. Chiefly the aniseed of angelica, the piquancy of black pepper and the gin of juniper. There’s also a very nice orange brandy accord. Fellow cinnamon-phobes need not fear, I can’t detect it except for a little sweet and spicy warmth. It’s a great opening. Juniper Sling settles down to a powdery, sweet and softly musky skin scent. I wouldn’t actually describe it as boozy from this point. It’s uplifting and light-hearted but not alcoholic. On me, it’s mostly about the tame musky/labdanum-y scent of ambrox and the gentle aniseed of angelica. Angelica can be herbal, green and spicy, the way it is in Angelique Sous le Pluie for example, or aniseed, peppery and musky, the way it is here. Although there are contrasting sweet and savoury facets in Juniper Sling, the sweetness takes over. I don’t find it fleeting the way some do, but it stays close to the body. Bear in mind that it is an eau de toilette so lasting power will be limited. It could easily be worn by either gender. It’s as androgynous as the boyish figure of a flapper. 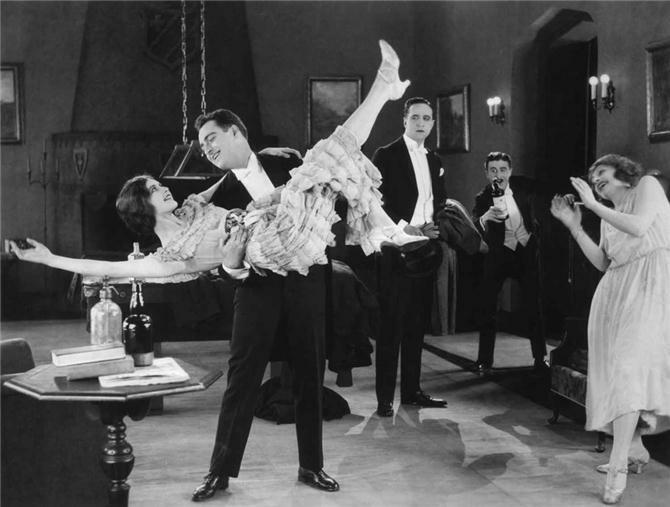 The backdrop for Juniper Sling is 1920s London, when the bright young things were doing the Charleston and listening to Jazz which were new, exciting and a little daring. No doubt they’d be smoking and drinking a few gin cocktails too. The mood was carefree and hedonistic, without a thought for tomorrow. I must admit I don’t find the fragrance as heady and boisterous as the Roaring Twenties. It’s rather too subdued for that, but this impression is probably down to the fact the deeper accords don’t show up on my skin (such as the leather, black cherry and vetiver). In the end, the musky sweetness is just too persistent for my taste. All the same, Juniper Sling is a playful yet modest fragrance which I can imagine working well as a discreet work scent. What are your favourite alcohol inspired fragrances? This entry was posted in By Tara, Fragrance Reviews, Penhaligon's and tagged Fragrance, Olivier Cresp, Penhaligons, Perfume, Review. Bookmark the permalink. I remember this one, and very much agree with your description of it being subdued, I also don’t remember the deeper facets showing on my skin. I didn’t know that it was inspired by the 20’s, so I learned something 🙂 i like juniper sling ok, although my favourites would be Idole edt and atelier d’artiste, both a lot spicier and darker. I suppose it’s not because of the alcohol that I like them 🙂 So I prefer the few perfumes that remind me a little of champagne like Vega, Arpege and royal Bain de Champagne. Thanks for sharing your alcohol tinged fragrances, even though you’re drawn to them for other reasons. Vega is definitely reminiscent of champagne. It’s such a celebration scent for me. And very classy celebration scents they are too. I own and like this one, and consider it very suited to weather when the *temperature* is in the roaring twenties – or thirties even, if we are talking the continent. It has a wonderfully cooling quality. But it is subdued and I like its powdery sweetness well enough. Like a G & T version of Dior Homme, maybe? Ha! Very good, V. It wasn’t as refreshing on me as I had hoped but I can imagine you wearing it well as the temps rise. Many thanks for the decant – I’d wanted to try it properly for ages. You can count me in the camp that find this one a bit fleeting Tara. I don’t recall getting more than a few hours from this which is a shame. Booze inspired fragrances though? Gosh I don’t think I have any. Perhaps a few with booze nots but even those are few and far between. My favourite of these is probably Vraie Blonde with its champagne and cognac but then again, I’m a sucker for clean aldehydes. Michael, I’m definitely in the minority when it comes to the lasting power of this one. I struggle to find any boozy fragrances in my collection too because I usually find them too loud and overwhelming. Ha ha! Glad I haven’t had you scrabbling among your samples for this one. I’m yet to find a booze inspired perfume that works for me either but I’m still hopeful. Thanks Sandra! I find I get on better with lighter alcoholic perfumes like this than the darker, heavier ones. It might be worth giving it a passing sniff when the weather improves. G&T scents are perfect for summer LJG. I’d love to try this. I do like the ‘fizziness’ created by Yvresse., especially during a warm Summer evening. For something darker and “warming’ during the colder months,, there is a ? Frapin scent 1789 or such number. And having recently just received a sample of Idole, I look forward to the cooler weather. I didn’t find Juniper Sling particularly fizzy but see what you think. Frapin is probably the best brand to go to for boozy scents like 1697 and 1270. I loved Juniper Sling for the short time I could smell it. In the end it went where it would be much happier, more often spritzed and better loved. I do adore the packaging and the Penhaligon’s bottles feel so nice to hold. Boozy scents? I quite like some of the early by Kilian, Frapin, quite a few Bay Rums and Ambre Naguille wears very boozy on me. 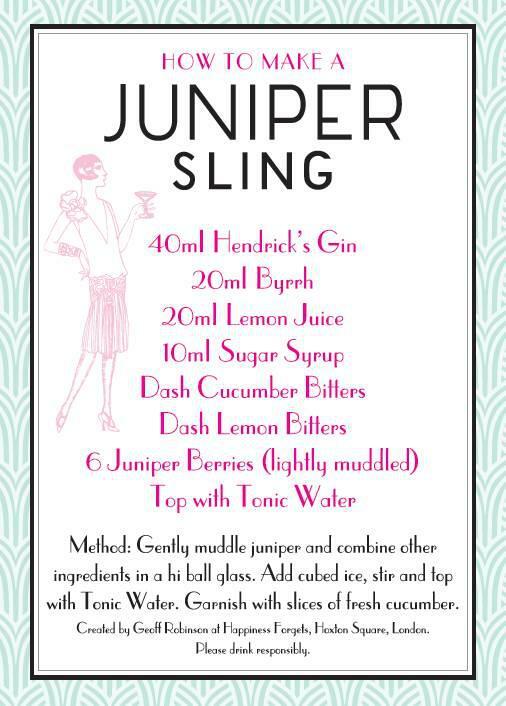 I don’t think Juniper Sling is big enough to match your personality. I also love the packaging and bottles. Thanks for sharing your favourite boozy scents. Nice picks. Not until the end of the month Miss P, but not long at all. There will be lots of pics I’m sure! Hurrah for drinkable perfume! Give Atelier Cologne’s Cedrat Enivrant a try if you haven’t already. Not my thing but it’s a nicely done gin cocktail scent which is very popular. It’s hard – if not impossible -not to regret giving away samples from time to time. Gin is one of my favorite hard liquors so I was very curious to try Juniper Sling when it was released. I did. The funny thing is that I love it… on my vSO but I have no desire whatsoever to wear it myself. I’ve never thought about drinks-inspired perfumes so I so not have a ready answer. But I want to mention the one that I recently tried and liked a lot – Frapin 1270. It’s funny how it works like that sometimes. At least you can enjoy it on your vSO. It has been an age since I tried I tried it but I think I found 1270 rather too sweet for me to wear but found it to be a great fruity/gourmand/boozy scent. Sorry that I am late to your review, but I was out of town for a few days. I’m really glad you reviewed this one, Tara, because I remember when Vanessa reviewed it, and it sounded so tempting and refreshing (especially as I like gin). And I’m certain that this would be refreshing, but it also sounds like I would have to refresh *it* on my scent-eating skin. I’m not one who cares to reapply perfumes often, so I think I’ll just enjoy Juniper Sling vicariously through your review. As for boozy fragrances, I like a number of them: Frapin 1697, Idole, House of Matriarch Carmine … and then, similar to Asali, I love aldehydic perfumes that remind me of champagne, particularly Chanel No. 22 and Vega. Thanks for taking time to comment after your trip away, Suzanne. I really don’t think Juniper Sling is a good choice for someone with scent-eating skin such as yourself. I’m lucky that perfumes seem to last well on me but this is generally very fleeting on most. I never round to reapplying either. I was interested to learn your favourite boozy perfumes. House of Matriarch Carmine is a new one on me.